Brain scans can detect autism long before any symptoms start to emerge, say scientists. The earliest that children tend to be diagnosed at present is at the age of two, although it is often later. The study, published in the journal Nature, showed the origins of autism are much earlier than that - in the first year of life. The findings could lead to an early test and even therapies that work while the brain is more malleable. One in every 100 people has autism, which affects behaviour and particularly social interaction. The study looked at 148 children including those at high risk of autism because they had older siblings with the disorder. All had brain scans at six, 12 and 24 months old. The study uncovered early differences in the part of the brain responsible for high level functions like language - the cerebral cortex - in children who went on to be diagnosed with autism. 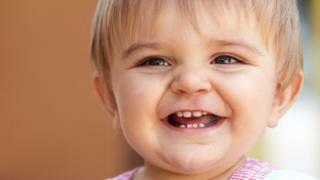 Dr Heather Hazlett, one of the researchers at the University of North Carolina, told the BBC News website: "Very early in the first year of life we see surface brain area differences, that precede the symptoms that people traditionally associate with autism. "So it gives us a good target for when the brain differences might be happening for children at high risk of autism." The study opens up possibilities for big changes in the way autism is treated and diagnosed. Giving children brain scans, particularly those in high-risk families, could lead to children being diagnosed earlier. In the long run, it might be possible to do something similar for all infants if DNA testing advances enough to become a useful tool to identify children at high risk. If it can be diagnosed early, then behavioural therapies such as those that train parents in new ways of interacting with an autistic child can be introduced earlier when they should be more effective. Prof Joseph Piven, another researcher on the project, told the BBC: "Now we have the possibility that we can identify those who are most likely to go on to to get autism. "That allows us to consider intervening before the behaviours of autism appear, I think there's wide consensus that that's likely to have more impact at a time when the brain is most malleable and before the symptoms have consolidated. "So we find it very promising." The researchers fed the brain scan images into an artificial intelligence. It was able to predict which children would develop autism with 80% accuracy. Dr James Cusack, the director of science at Autistica, said the approach was "highly innovative and exciting". He added: "Early, accurate diagnosis is the key to families being able to access the support they need. "We've still got some way to go, but one day, through continued investment in research, we may be able to diagnose autism in babies using innovative approaches like brain imaging." Carol Povey, director of the National Autistic Society's Centre for Autism, said: "It's possible that MRI scanning of this type could be developed to help families who already have an autistic child to access earlier diagnosis for subsequent children. "This would mean those children could receive the right support as early as possible." However, she warned that autism was manifested in many different ways and "no single test is likely to be able to identify potential autism in all children". The study also pours further cold water on the debunked claims that the MMR jab causes autism. One of the reasons the link took hold was that autism tends to be diagnosed around the time that the vaccine is given to children.